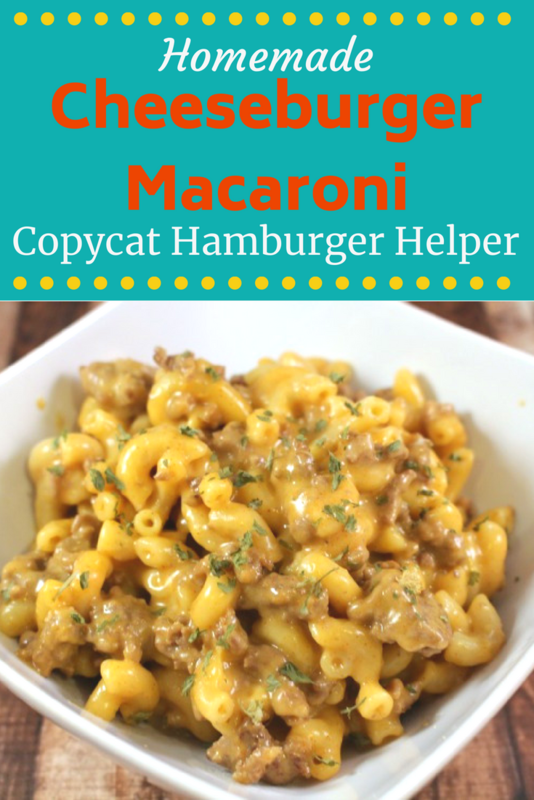 This super easy homemade cheeseburger macaroni is a perfect Hamburger Helper Copycat Recipe! This made from scratch cheesy pasta recipe is made from ingredients you likely have in your pantry/refrigerator right now! 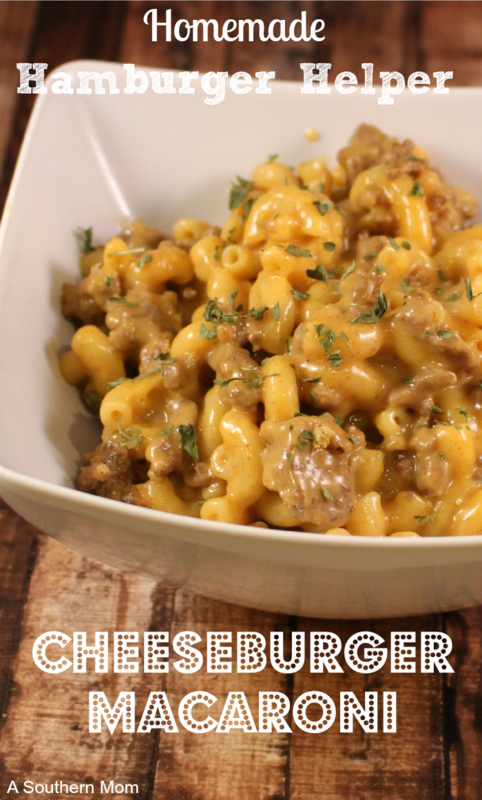 You will most definitely ditch the box when you see how easy this copycat cheeseburger macaroni recipe is! I'm just going to admit something here. I LOVE Hamburger Helper. Yes the super bad for you, preservative filled box of powdered seasoning and noodles. LOVE LOVE LOVE it. This one is my favorite, but I also love me some Cheeseburger Macaroni! Yum. I recently found a recipe for Cheeseburger Macaroni from scratch though and you know what? It's not that much more difficult! In fact, it's honestly about the same amount of work. And yes...it is BETTER than the box mix. From now on, we will be making this homemade version. I've made it 3 times so far and 3 out of 4 family members LOVE it and go back for seconds (the 4th one likes dinosaur chicken nuggets and PBJ's.). If this becomes a "go to" meal for your family, you could theoretically even make baggies of the spices & cornstarch and keep it in your pantry to make this dish even faster and more simple! Feel free to use ground turkey or ground chicken! Go ahead and brown your ground beef in a fairly deep pan or pot (you'll be adding a lot of liquid). Drain the fat off the meat and put it back in the pan/pot. Add spices, cornstarch, water, pasta and milk and bring to a boil. Bring your heat down to a simmer and let simmer until the pasta is finished. Add your cheddar cheese and turn off the heat. Stir until the cheese is melted. Let sit for a few minutes and serve! There have been some comments about this being bland...you need to season this to taste. If your family is VERY used to the boxed Hamburger Helper, this probably will be very bland as written. So adjust seasoning to your family's liking. Salt and pepper to taste. Keep tasting. This is how you make a recipe work for YOUR family. There are some helpful tips from other readers who have made slight substitutions with success, be sure to look at those and decide if those will work for you. This is a great base recipe that my family LOVES, but your family might need to tweak it...and that's perfectly alright! Drain the fat off the meat and put it back in the pan/pot. Add spices, water, pasta and milk and bring to a boil. If I normally have to make two boxes of HH for my family would I just double this recipe? Or does it make more than a box would?? It makes about 2 boxes worth I’d say, but the pasta to meat ratio is a bit different. You might double up on the meat to stretch it further though. You end up with more pasta with this recipe. I agree, this is out of this world! As close to the box as you can get. I’ll omit the sugar next time, didn’t need it . Can you pre cook the pasta? 3 cups of liquid seems like a lot, does it turn out too liquidy? Karina, it does seem like a lot, but it’s really not! If you pre-cook the pasta, you’d have to adjust probably the entire recipe liquid wise…. All of the liquid gets absorbed for the most part. What’s left ends up being the sauce. Hope you enjoy it Gabby! Just tried this tonight with ground venison and it was a huge hit. I doubled the meat in the recipe and had to keep adding a little more liquid so it wouldnt stick and the macaroni would get done. Also added a little more of each of seasonings since venison has a more “wild/gamey” taste. Delicious! I don’t buy ground beef a lot since we have a freezer full of ground venison and i am always looking for new creative ways to use up the venison. I can see this being added to the meal rotation for sure! Thanks for sharing! Awesome! I have never actually had venison, but I bet that tasted awesome! This is so delicious & a million times better than the boxed hamburger helper! When are you supposed to add the cornstarch, though? I came here from pinterest and I would like to try this, but I’m not seeing when to add the cornstarch either? I just made this tonight, and I assumed the cornstarch went with adding the “spices”. I did that and it turned out fine. I would add a bit more of each spice next time and add a little less cheese for a less “cheddar-y” flavor. I made this for dinner tonight and it was very good. I wont be buying the boxed stuff anymore. Thanks for sharing! I am eating this as we speak! Very yummy. I buy my pasta in bulk from Sam’s Club, so my package was 16oz, didn’t measure it at all, but I did find myself having to add more water and milk. I just went between the two, add some milk, let it cook, add some water, let it cook, and so on and so forth until my pasta was done! This is a really good recipe! And you know what is in it! Thanks for sharing!! Made this for dinner tonight. It was very bland. My husband and I added everything from hot sauce to parmesan to try to flavor it up. I’m sorry! We did not find it bland at all. I do love to eat mine with ketchup, but that’s a weird quirk I picked up growing up. The rest of my family eats it as specified above. I just made this, but doubled the recipe. Too much liquid! What’d i do wrong?! I doubled Everything so it shouldn’t be a ratio issue. Should I add more cornstarch? It wo9;#n&d3ult matter if he raped a 7 year old boy on the White House lawn. Unless the GOP regains the Senate and House, none of this will ever be brought to light. Certainly not by the MSM.Now, had ths been Bush, he would have been forced to resign, and quite possibly, kill himself. I don’t know what I did wrong but mine came out very bland. I was so disappointed. I even added extra seasonings and still..nothing.. Mine was bland as well. I tasted the finished product and it was all milk and paprika to my palate. Admittedly, the MSG in the box mix is extremely salty. I think my palate missed the salt, but salt did not help. So, I doubled all of the spices except paprika and added chili powder and cumin. That worked. I won’t try it again, but it sated my craving for Cheeseburger Mac. Don’t apologize! Nostalgia tastes different to all of us :). You can see that you had many very positive reviews and a couple of blands– a small minority of us just like that MSG taste (which…ugh, gross). Thank you for helping me get my cheese mac without the box and all those preservatives. Raging against Ralph and Richard is like raging against Obama because you are disgusted with the Bush Adnrtistiamion. These guys are actually trying to change things, or at least are in support of changing things in the right direction. I guess all jews and zionists are the same, huh? Added few splashes Worcestershire , 1/4 cup ketchup , 1tsp spicy mustard and more spices and used shredded Colby heaping cup . Tastes great !!!! Great adds! I might try that spicy mustard next time! I made this for dinner tonight and it was a hit!! So much so that it went into the recipie book so I can make it again 🙂 So happy to have a healthy alternative to HH. Thanks for sharing. I thought this recipe was great! The only thing I did different was brown the meat a little longer and on higher heat to get that slightly dark brown crusty-ness. Adds so much flavor and when you add the milk and water, you scrape the bottom of the pan to get all the yummy bits. I also added a half tsp more of onion powder and garlic powder. And instead of using salt, I used a tsp of garlic salt. I like things on the saltier side but without using actual salt. This will definitely be a staple in our home now 🙂 Thank you for the recipe! You do realize that garlic salt contains “actual salt,” don’t you? Hello, I made this dish tonight and found it very bland. I added extra cheese and seasoning still bland. I ended up throwing it away. I found it a bit bland for my taste too but we added a chicken bullion and a 1/4 extra milk. So yummy! Way too much liquid. What did I do wrong. It could be many things. Did you use enough pasta? Did you drain your meat? Did you let it simmer long enough, etc. Without having cooked it myself I have no way of knowing. Sorry! Do you think instead of ground meat, you could use ground sausage? I definitely think you should. It would be a different taste (not so “cheeseburger”y) but should still be tasty! I used venison, sauteed onions while I browned the meat, added lawrys salt, a tablespoon of worcester sauce and 2 tablespoons of Dijon mustard. I also used sharp cheddar cheese. Yummy! Thanks for this recipe! My kid was starving and I had everything! I love recipes like that! Made this twice. Once the way the recipe is written, delicious!! The next time I added some chili beans!! Really good also!! Its a nice spin on the recipe. Yum! Delicious! Just made this last night. Used half light cream and half evaporated milk and added a tiny bit of taco seasoning. Extremely delicious. I always taste as I go so near the end I felt I needed to throw in a little more seasoning to fit my taste preferences. Oh and I hate to admit it but I also threw in some gooey velvetta cheese with some cheddar. Couldn’t help it. Thanks so much for this recipie. This recipe was great! I added more noodles and cheese since Im not a huge meat eater and it turned out fine. Reheats well the next day, and I definitely feel better about eating this over the sodium/chemical laden hamburger helper version. Thank you!! When do I use the cornstarch? Do I have to use sugar? Can it be optional? This recipe is awesome! I did a few things different.. Once at my husband’s urging I tried just the hamburger with Velveeta Shells & Cheese, but it was not quite right.. I doubled everything except the pasta, I used shells instead of elbow macaroni.. I did not have enough milk so I used half & half.. And I used Velveeta cheese, because I read the recipe was bland.. I know this isn’t a “health conscience” approach to Cheeseburger Macaroni, I will make adjustments to my diet in another way! Making this right now and it smell amazing! My husband is so excited to try it, glad to move away from the boxed products! This looks delicious! But do I have to use cornstarch? I dont have any. And how many does this serve? Thanks! I did not need the cornstarch at all. I made this tonight. It was very good. I doubled the recipe and added about a half teaspoon of Dijon mustard. My husband added ketchup to his. I think next time I will add in onions when I brown the ground beef. Thanks for the recipe. It was a hit with my family. I have to say, from the other posts about it being bland, I was worried so I amp’d it up a bit. I used beef stock instead of water, I added 2 tsp approx of Kitchen Bouquet at the end and I cooked my hamburger with a tiny bit of bacon grease for a pop of flavor. I gotta say, it was really good and my hubby happily gobbled it up. He ended up sprinkling his with some ancho chile powder in the end b/c he can’t live without some heat in his food. Definitely will be adding this to our rotation. So much better than the box! This made me laugh so hard…I am skimming through all these comments trying to find that answer. It just keeps getting ignored. I’m just going to leave it out…obviously it’s not important. Ha. Hope it worked out! It’s right in the recipe instructions! So, it’s 2 1/2 months after you were making it, so not going to help either of you ladies, but the directions say to add the corn starch when you add the other spices. Maybe it was added in after you were making the recipe, but it is up there. It does look like the printable version doesn’t have it listed, but if you read the actual post with the list of directions, it is there in step 2. I’ve made this several times, my family loves it. You add the cornstarch with all the spices, pasta, milk and water. The ingredients are listed in the order that you add them. I also add about 3 tbsp or 1 packet of dry ranch dressing mix. We love the cheeseburger ranch hamburger helper, and adding the ranch powder makes this taste amazing! I’m sure you could add regular ranch dressing from the bottle and it would work as well. I’ve been making my own “hamburger helper” for almost 40 years …I think this might even pre-date the product! LOL What I do is very similar to your recipe, except I always add one can of tomato sauce at the end and mix well. It completely changes the flavor, but in a great way. This has been my go to fast, easy, filling and good meal in a house of guys for decades now. To this day it is the most requested dish when my sons come home for a visit now that they are grown. Try the tomato sauce in the recipe, even if you aren’t a ketchup on everything person…..he difference it makes in the flavor is astonishing. AWESOME!! I read the comments so I tweaked it a bit. Didn’t have paprika so I added dry mustard, chili powder and Worcestershire sauce. Also used fresh garlic and onion instead of the powders. Added a generous squirt of ranch dressing after the cheese was melted!! My very picky kids asked for seconds! YAY!!! Guys you add the cornstarch with all of the other dry spices/ingredients. Since everything cooks in one pan I don’t understand the big confusion. It’s just a thickening agent like flour nothing to be afraid of …..
Just made this tonight and it is DELICIOUS!! I never post on recipes but this was so good I had to. I even made 1/2 this recipe and it still turned out perfect. On a side note; I added the cornstarch when I added the spices. I dont know if this is right or wrong but it worked.Great Recipe! This was a huge hit with my family of five. Everyone cleaned their plate tonight. To give it a little more taste I sauteed fresh chopped onion, pressed garlic and mushrooms in butter before adding and cooking the meat. This is like comfort food! I added a can of Rotel diced tomatoes and green chile’s for an extra kick it’s so good! Thanks for a great recipe, my family loves it. I’m so so glad that you love it and that you have made it your own! Thanks for commenting! Every time I make this it’s a hit! If you want to make it more flavorful use chicken stock instead of water. I use low or no sodium so I I can put as much salt as I want. It’s even better. So glad y’all love it! I just made this and it is delicious! It was perfect.I Just followed the directions exactly. After reading comment I knew I need to amp it up while cooking, I added some garlic, and curry powder, amd crushed red pepper flakes to the meat. Also, had crumbled bacon at the end, yum, family of 5 finished their plates here with it, good recipe! Overall pretty good, but I did find it a bit bland for my taste. Totally amped it up with smoked paprika, Worcester sauce, Dijon mustard and the other spices as per the recipe (doubled those). Salt and pepper to taste and added a dash of dried basil. I did add a bit of extra milk as the macaroni cooked. De-lish!! My boys loved it! I made this for dinner tonight – I doubled the onion and garlic powders as well as the paprika. Our family LOVED this. My husband went back for seconds and he never does this. He said it is definitely a keeper – My four year old even finished his plate! Do you cover the pan when it’s simmering? I didn’t! I felt like the water wouldn’t cook off if I covered it. It came out perfectly uncovered, although I did add a bit more water as it was cooking. Easier to add more than to try to remove it! I love this! Tasty dinner in no time! I thought your recipe and directions were perfect. Thanks for sharing! I used sharp cheddar and some jalapeño havarti and it was delicious! Amazing recipe! I added some grilled onions to my batch and it was a home run with my boys. Thank you! I supposed with enough ketchup or sriracha anything is good…. but it was very bland without it. SUCH DELICIOUS COMFORT FOOD! I added half an onion when cooking the beef, about 2x the garlic powder to taste, a dash of chili powder, threw in some american cheese in addition to cheddar, and a couple dashes of worcestire and Sriracha to deepen the flavor. It is by no means a fancy dish, but is such a fun way to mix it up and serve something fun for dinner. I HIGHLY SUGGEST ADDING A BIT OF HEAT…whether it be chili powder, hot sauce, sriracha….it really helps bring out the flavor. I have tried several of the homemade hamburger helpers. They have all turned out very good. So I am looking forward to trying this one. Since I have tried others I am giving this one five stars because I know it will be just as good. My husband and I are anti box anything due to unknown preservatives. I do sometimes miss the ease of box meals. This was just as easy and quite yummy. Pretty sure this will become my go to easy meal. Thank you for sharing! This is a good base recipe…for extra flavor I added some ketchup and mustard as well as I seasoned the meat with hamburger seasoning. I have this cooking right now! It smells and looks amazing! I did add some ketchup and worchestershire to it. I am totally going to make up bags of premeasure season and pasta for a “box” kinda meal! I just made this tonight and it was perfect. I added about 1/4 cup more milk while cooking. Yes it would have been bland if I had not added spices to my tasting, but everyone is different. add the spices you like and make it your own. I added a chicken bullion cube, about 2 tablespoon garlic and onion powder, 1 tablespoon paprika and salt and pepper to taste. I also seasoned the meat while it was cooking. The cornstarch thickened everything right up and I added a tiny bit of Velveeta to make it a little more creamy too. 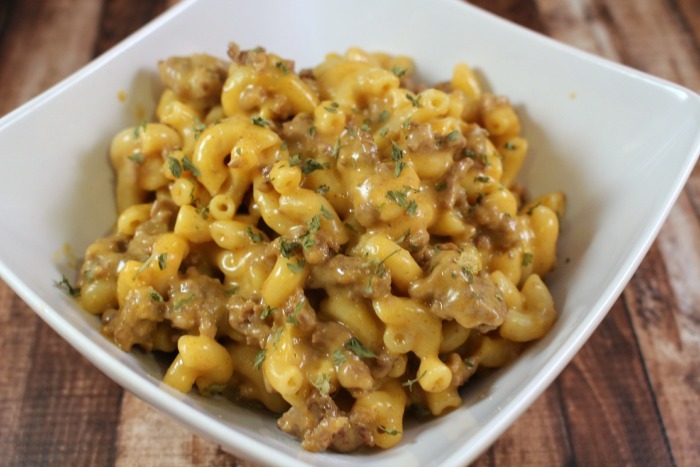 This was fast and easy and delicious and better than the box hamburger helper. I will be making this again for sure! Thank you for the recipe! This was so easy! I love that you just throw everything in the pan after browning the meat. I did double it without any problems. I did not leave the lid on while cooking it. I hit it with just a sprinkle of cayenne and added almost 2 cups of raw broccoli the last 4 minutes of cooking to make a complete meal in one pan. Excellent, simple and easy. A keeper! I’ve tried a million recipes trying to find my grandmothers. I found yours, it was similar, and I gave it a shot. So glad I did, bc I added a tsp ground mustard, and a knorrs bullion cube and it was official. This is being added to our monthly menu! Thank you for sharing! I added a tomato paste cube and chili powder and it tasted so delicious. My hubby said it was better than hamburger helper. I also grew up on Hamburger Helper & when my husband & I were in the beginning stages of our life together we also ate it. My husband still loves hamburger Helper however, I stopped buying it years ago. Thanks to your recipe & the Banza pasta we can all enjoy the flavor w/o all the processed crap or heavy startch filled noddles!!! Thanks so much for your recipe!! I threw in a few slices of cooked chopped bacon and it was awesome!! I loved it. I added a green pepper and a chopped red onion in stead of the onion powder. It’s better than the box I usually make. I’ll be making it again. I used beef broth instead of water, doubled the seasonings and liquid since I used more pasta and left out the sugar. Also sauted an onion and garlic with the hamburger. Turned out pretty good. This was a great recipe! I cooked my pasta separately bc I used egg noodles and it was fabulous. I also used a little bouillon. Use beef stock in place of the water or a couple beef bouillon cubes!! I doubled the garlic, onion, and paprika, and added some red pepper, a TON of cheese plus some Worcestershire sauce and serving it up now. It’s going to be a hit.